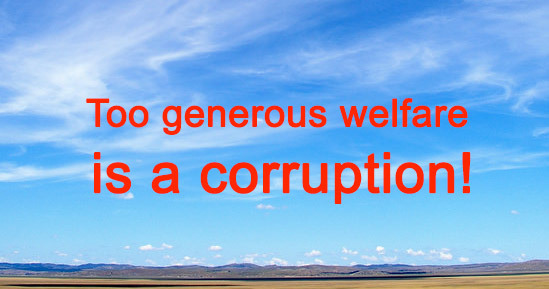 Too generous welfare is a corruption! Bbonus is always a talk of the town at the end and the beginning of a year. Last year, 2016, a 'super' bonus of 22 months from a land development enterprise in Thailand has caught an attention in the internet. Everyone loves big bonus, however, there are cases that too generous welfare is a corruption! Nevertheless, this article does not place the enterprise mentioned above as corrupted. Some organisation can afford big bonus as their main production factors are not human. Different businesses rely on different resources. For example, land development enterprises rely mostly on land and buildings; banks rely on finance; and factories rely on machines. Employees are just cogs in the wheel. When theses enterprises succeed, they could afford generous bonus! On the other hand, enterprises that rely on human resources as their main production factor cannot afford such expense. You might be astonished at how CSR (Corporate Social Responsibility) is related to a welfare, as it is commonly interpreted as a voluntarism for social and environmental benefits. As a matter of fact, the main concept of CSR is to NOT involve in corruption. Too generous welfare has high costs which affects the benefits of other people in the circle such as shareholders, especially minor ones, and customers who have to carry the costs. There are many cases which represent the argument above. Many would have heard of an airline which provides their ex-air hostesses with a priority to travel across continents with only one-day notice and a 500 Baht charge, from a standard 50,000 Baht fare. While ex-pilots would be charged 1,000 Baht for a business class which worth 130,000 Baht. In this case, the rise of people with privileges would cost a big amount of money. This money could be better use as a profit for shareholders, a bonus for general employees, a discount for customers or a benefit for societies. Moreover, many might have heard of some giant enterprises in some countries that provide their employees with a low to free fare for their utilities, causing their shareholders and customers to carry the load. In the end, the priority of these employees became a hinder to a development of a country. It is noticeable that giant enterprises with high profit in some countries, provide high benefits to their employees. In a sense, it silents employees and stop them from protesting against a higher level of corruption in the organisation. Like a pyramid, it is a corruption that spread out thoroughly and orderly from people in a higher position to a lower position. The giant enterprises in some countries provide a huge car park building for employees, while it provides a small, outdoor car park for customers. Unlike private companies such as TESCO which provide sufficient parking lots with shadings for customers. Some giant enterprises overfeed their chief executives with benefits that they can even withdraw money for religious use. This ubiquitous corruptions can occur in governmental sectors. It is common to see high-position officials in many enterprises’ board of committees. Some of them have a position in more than one enterprise. With all the benefits they were provided, some of them were granted a lifetime service even after their resignations. Another example is the company’s car, it is common to see committees and executives of the government sector, state enterprises and public corporation, receive high budgets for cars, gas and maintenance. Also, they were provided business class flights and luxury hotels. It is common to see high-position governmental officials of state enterprises, flying to different countries using these luxury benefits. It is unlikely to find anyone who neglects these great benefits, as they have to strike while the iron is hot. It is considered a robbery from public interest to smaller privileged groups when the state enterprises pay a 12-month bonus to employees, the amount that even giant public corporations or financial institutes can not afford. Some Provincial Administrative Organisation even covers medical treatment expenses of officials and their children. By allowing government officials to determine their own welfare without any representatives, they will end up overfeeding themselves. You might question how these big enterprises can provide their employees with great benefits which other enterprises cannot afford. It was not for their higher intelligence than other human but their monopolised business such as public utilities, banks or other public services. These enterprises lean on low capital value to produce high profits, due to an (almost) monopolised business or plentiful natural resources. While the human resource is not their main production factors, they can provide high benefits to their employees. It can be concluded that this kind of corruption does not build but destroy public image of the enterprises. The loss of society’s confidence affects in lower dividend for stockholders and higher charge for consumers. This burden can not be eliminated with CSR activities such as planting more trees or donations. It would only be an act of face-saving and promoting their reputation in politics and upper class. In order to grow sufficiently with CSR, public and private enterprises in every country need to solve a corruption in terms of a too generous welfare. However, public land development enterprises can not compete with private enterprises. It appears that the state should not compete with the private sector as it results in wasting more annual government statement of expenditure instead of supporting more developments of the country. In the end, a corruption obstructs the country’s development. Especially without representatives who inspect the system, leading to more corruption and more declination in the country.